We have Emma’s birthday coming and then Christmas following just a few days after. The end result will be an influx of useless toys that will crowd the playroom. I’ve been trying to find ideas for her that won’t add to the clutter, but that she will still get excited about. I recently discovered Uncle Milton’s line of educational toys, one being Earth in My Room. Like a globe, it offers a view of the earth–or at least of the Americas, as you’d see it from outer space. I love that this is less of a toy and more of a piece of decor for her room. One that she can learn from. The Earth hangs on the wall and is controlled by remote. In a dark room, you’ll see the earth illuminate. You can either choose a specific phase (area of the earth that lights up), or let it automatically run through the different phases. Either way, it will automatically shut off after 30 minutes so kids can watch as part of a bedtime routine. In an attempt to get a decent picture of the earth, I took it into my laundry room where I could have some darkness for the illumination and a little light so that I could photograph it. 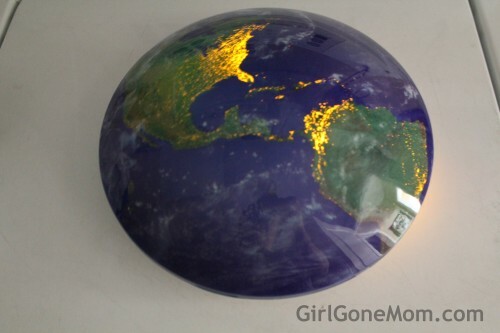 At just over $20, Earth in My Room would make a great, and very reasonably priced gift for the holidays. One lucky person will win Earth in My Room from Uncle Milton’s Toys! 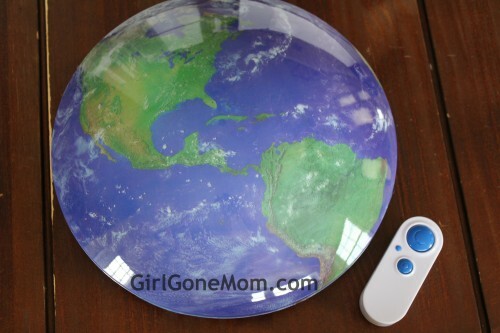 Thank you to Uncle Milton Toys for providing the Earth in My Room for review and giveaway. The Mini Wildlife Projector looks fun! The Ant Farm is cool too! i love the Fireworks Lightshow, awesome. My son would love the Fireworks Lightshow. Actually, I’d even like it in my room! I also love the Moon in my room!